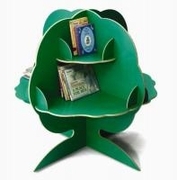 Children will be sure to pick their favorite story from the shelves of the colorful Green Reading Storage Tree. Rounded edges, rooted strongly and sturdy on four legs. Eight attractive shelves for holding books of various sizes. GreenGuard certified. Made in USA. Dimensions: 39in. × 39in. × 42in.